It's that time of year when we hold our AGM's, elect officials and make decisions about next year. The key takeouts for 2019 from AGM's held in November are outlined below. Vice President: Graeme Caffyn (subsequently resigned). Greg Michael appointed to the position by Management Committee. Full Membership Subscription Fees increase by $20.00 effective 1st July 2019. Vets Annual Membership Subscription Fee for 2019: Ordinary Member - $10.00, Restricted Member - $5.00. Click the button below to read the Vets AGM Minutes and Package of Reports presented. 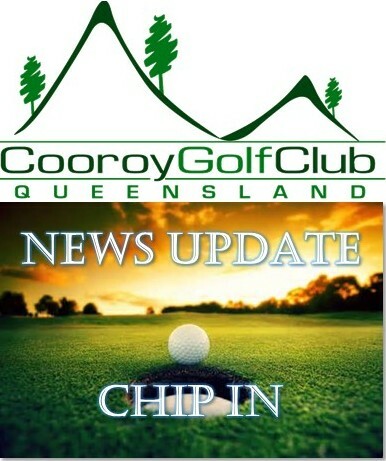 Cooroy Golf Club is offering a 'one-off' full membership special as part of a drive to increase member numbers. Spread the word. Join now and enjoy full ordinary membership through to 30th June 2020 for a total cost of just $830.00. The offer is open until 30th June 2019 - conditions apply. By taking up the offer as quickly as possible you enjoy the maximum free benefit period; up to 6 months free membership. For the past five years, golf governing bodies have been working on a makeover of the Rules of Golf. As from 1st January 2019, the results of the first fundamental review in 34 years come into effect. The changes are quite extensive, and welcome. Although the new rules don’t come into effect until the new year it will pay to become familiar with them in advance. Remember rules exist to benefit players not hinder them. To assist, an abridged, player-friendly booklet version of the new rules - Player's Edition of the Rules of Golf - is available to members in the clubhouse together with a rules flyer. An updated version of our Local Rules reflecting club decisions on the optional aspects of the new rules will be issued shortly. The Thursday women's competition is now offering a nine-hole competition that tees off once the 18-hole competition field is away. This allows those not so comfortable playing 18 holes to stay involved, particularly as we head into the hotter months, and arrive back in the clubhouse for some socialising with 18-hole players. A Holiday Season 9-Hole Series will run each Friday and Sunday over the holiday period. Eligibility: Must have a GA handicap (9 or 18-hole) - visitors welcome. Daily prizes and series prize sponsored by Coopers Brewery. A reminder tickets in our Xmas raffle are available at the bar. The many prizes on offer include a hand mower donated by Toro and a Mizumo golf bag. In this issue, we introduce Kelvin Brittain. And yes, that is Kelvin under all that protective leather in an earlier life drag racing at Willowbank. Kelvin is very much a local boy having grown up in Kin Kin. He then moved to Cooroy which has been home to Kelvin, his wife and two children for 32 years. Following year 10 schooling Kelvin went to Brisbane to undertake an apprenticeship as a fitter and turner and then worked in maintenance for a period of 37 years. 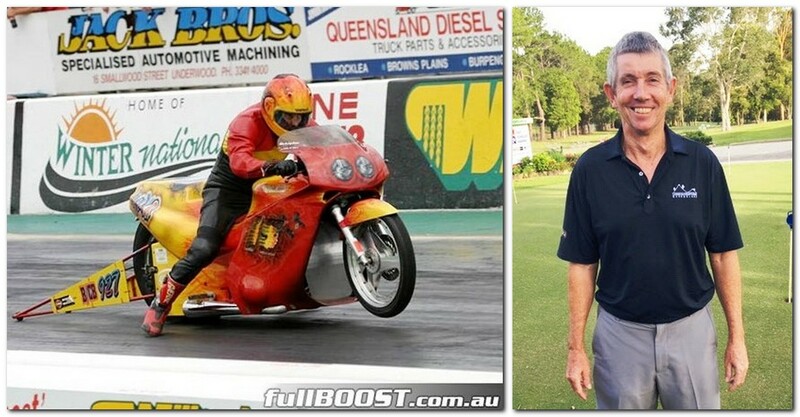 Kelvin raced enduro bikes in his younger days and then his love of speed led him to drag racing and motorbikes for 15 years, with the support of family. Enjoys all forms of motorsport, mountain biking and golf. Kelvin has been a member of Cooroy Golf Club for 25 years, working behind the bar for nearly 2 years. In the last 10 years, Kelvin has been able to travel with both his wife and on occasions daughter, as well, visiting countries as far afield, such as USA, Africa, Ireland, Scotland and England. And, has also travelled across the ditch to New Zealand. As exciting as all these countries are, he says he is always grateful to come back to Queensland, Australia.......home. The left wrist should appear concave looking down at it in your address position. The knuckles of first (pointer) finger and index finger should be clearly visible to you. At impact the left wrist should be flat, even a little convex: the knuckle of your first (pointer) finger just barely visible. Landcare revisit and works will commence at the end of January or beginning of February. They will provide their landscaping plan and will undertake all work.